Feedlot utilisation levels are a key performance indicator of feedlot operations. Using saleyard data that indicates buyer behaviour of feeder cattle, we have created a forecast model for feedlot capacity utilisation as we head toward 2020. Utilisation numbers as an indicator of feedlot performance are the preferred index relative to total numbers of cattle on feed, traditionally highlighted as an indicator of industry performance. By accounting for the number of cattle on feed as proportionate to total capacity, we are best able to visualise how feedlots are using the available resources and infrastructure that is available in the industry. Historical movement in feedlot capacity and utilisation levels demonstrate that capacity increases do not always result in high utilisation of the existing feedlot infrastructure (Figure 1). While the past two quarters have seen an increase in the number of cattle on feed to consecutive record-breaking numbers, it was not a sign of greater profitability. Utilisation for the past two years has remained volatile but relatively high, between 75-86% utilisation nationally. The past quarter has seen its fair share of struggles in the feedlot industry. High grain prices, a poor harvest with limited roughage availability and fires in southern Queensland will all place significant difficulties on the feedlot margins going forward into this quarter. Accounting for these recent developments, combined with weather forecasts, currency outlooks and emerging saleyard trends, we are looking to see Feedlot utilisation levels fall to their lowest point since September 2016 to around 72%. Capacity changes are expected to have little to no impact on this forecast, with growth last quarter changing less than 1% nationally. The prospect of lower levels of feedlot utilisation, toward levels that we have not seen for a while, could reduce the demand for feed grain and other feedlot inputs going forward. Feedlot marketing’s of grain-fed cattle would likely follow the utilisation drop in early 2019; something else to look out for in the new year. 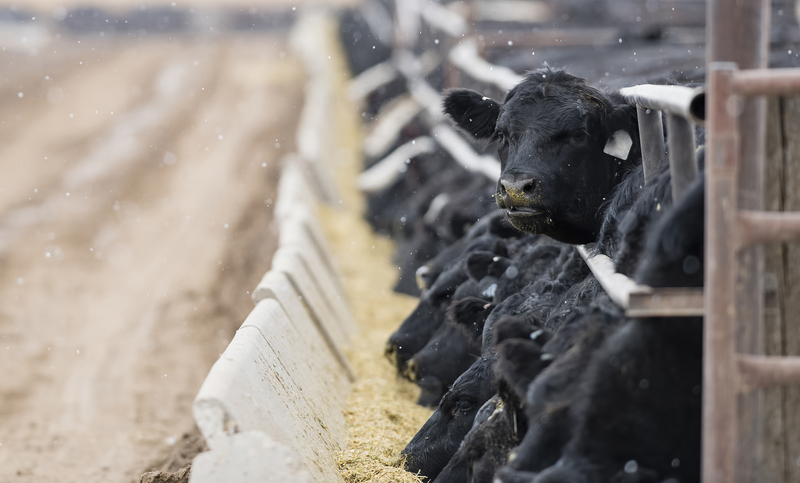 Into the second half of 2019 the model estimates that feedlots will be looking to restock as the utilisation levels are forecast to climb back toward the 85% area. This is potentially a good time for producers with feeder steers to bring them into the saleyard. A volatile 24 months has been seen in feedlot utilisation, bouncing between 75-86% utilisation. 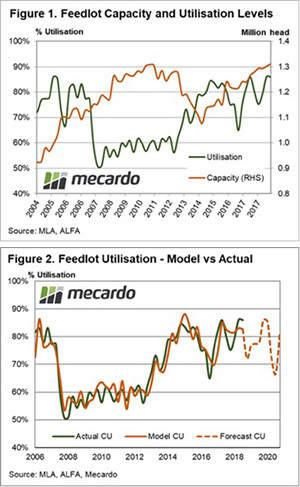 Utilisation model forecasting tips feedlots to be at around 70% capacity for the coming quarter. The second half of 2019 forecasts a recovery in feedlot utilisation numbers; a good time maybe to have feeder steers in the saleyards.